I was very excited about this trip because you know… Siargao! Virgin islands, surfing, the famous Magpupungko Rock Pool. 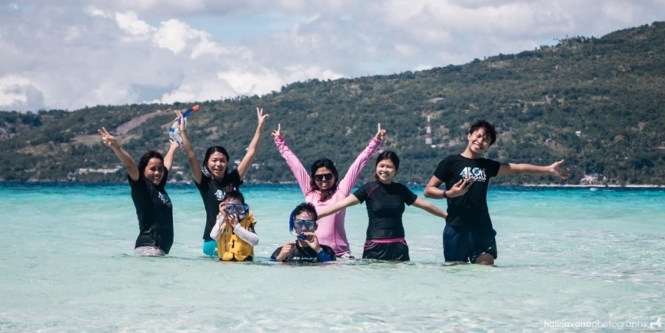 To give you a bit of a background: this Cebu-Siargao trip is a project of Alon ng Pag-asa, a small group of travelers engaging in voluntourism in the Philippines. We planned this trip as requested and supervised by a fellow volunteer, Kuya Danny whose beloved home province was Siargao itself. We extended assistance to school kids in Barangay Caub/Caob in Siargao. Of course, before and after the main outreach event, we planned side trips and tours. 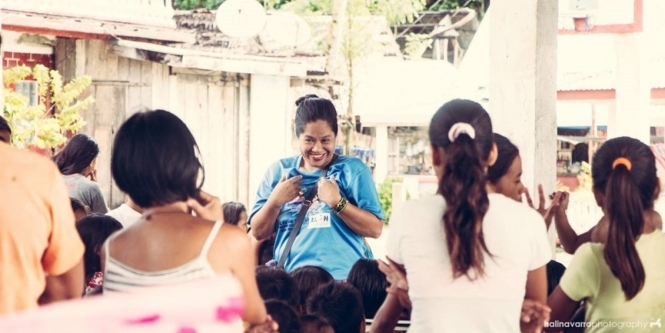 This is what voluntourism is about — giving while traveling. This outreach was scheduled in November, and we waited for airline promos as early as June. Due to limited availability of discounted airline tickets, there was a one-day layover from Cebu to Siargao. Here’s a summary of our trip. We had more than 24 hours before our flight to Siargao, and so we decided to explore Oslob in Southern Cebu. In the wee hours of the morning, we took a bus in the South Terminal to Oslob. We arrived in the morning and experienced swimming with butanding (whale sharks). Guests can opt to stay in the boat and just watch, but I highly recommend jumping in the water… it’s a one-in-a-lifetime experience. After a short breakfast, we took a boat ride to the posh Sumilon Island about 15 minutes away, where we beach-bummed for a few hours. To cap it off, we rode a pickup to Tumalog Falls, a tall waterfall with gentle water curtain and umbrella-like rock features. We went aboard a morning flight to Siargao and stayed at Isla Verde Resort in Del Carmen, which is in one of the many islands in the area. 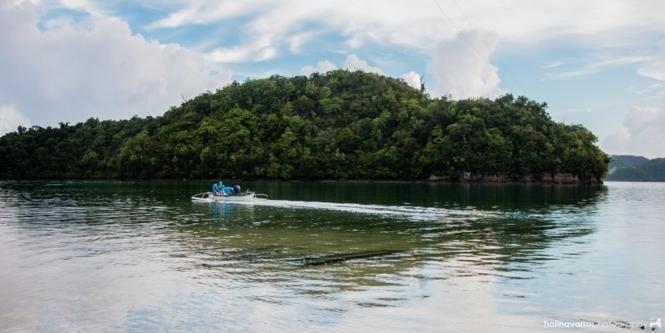 Renting a private boat, we island hopped around del Carmen, an off-the-tourist destination in Siargao. We visited Hidden Lagoon (also known as Sugba Lagoon), where our boatmen showed us lush islands reminiscent of those in Palawan; Kahuwagan Island, a still virgin island surrounded by the open sea; and Midway Island, an abandoned resort wherein visitors would have to jump from its beautiful pathway to enjoy the waters. In the morning of our third day, we went to Barangay Caob for our outreach event. We gave school supplies to 150-180 school children. We also held games, a short instructional demo on the proper brushing of teeth and washing of hands (I didn’t even know there was a proper way to wash hands, did you?) as supervised by our medical volunteers, and a feeding program for both children and adults where we served spaghetti, biscuits and chocolates and candies, with tetrapacks of juice drinks. The challenge was to get past the communication barrier. 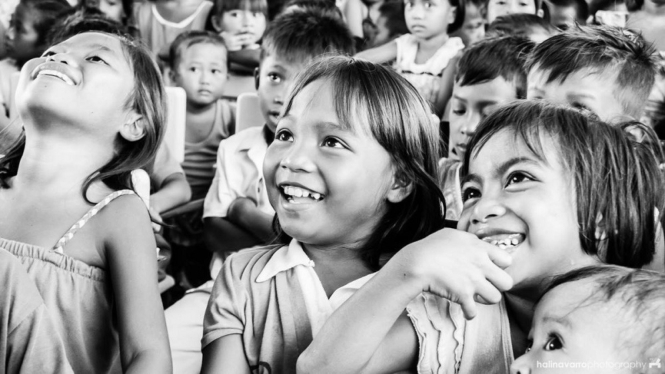 Some of the kids understand Tagalog but are not proficient speakers. We asked the teachers to translate for us. Luckily, a fellow volunteer, the generous Ate Rina, is well versed in Surigaonon and general Bisaya and was also of great help. All in all, despite this challenge, it was a successful outreach event. We visited two of the most famous spots in Siargao: Magpupungko Pool and Cloud 9 in General Luna. We had to visit Magpupungko Rock Pool first, to make sure it was still low tide. The pool isn’t that visible during high tide as it starts to merge with the sea. I can’t express how much I love this place, the clear emerald waters and the way the rocks contrived to form a natural pool just beside the sea. There’s also a cliff used for diving into the pool. Later that afternoon, we went to a resort in Cloud 9 to experience what Siargao is most famous for — surfing. Beaches in Siargao offer big, consistent waves suitable for beginner and professional surfers alike. An afternoon is a bit short to enjoy surfing in General Luna. Hali has already mentioned plans of coming back here. (Update: We actually came back here a year or two later on. You can read about our second trip to Siargao Island here. 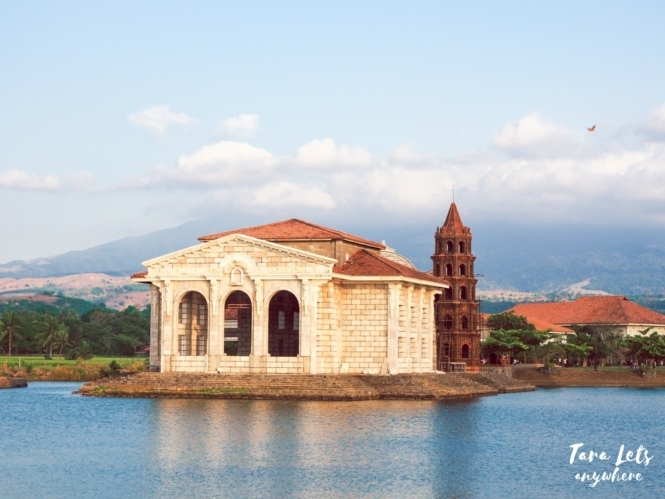 Majority of the old structures we visited were under construction (Magellan’s Cross, Basilica del Santo Nino, etc.) for fortification against earthquakes. However, our Cebu city tour was not in vain. 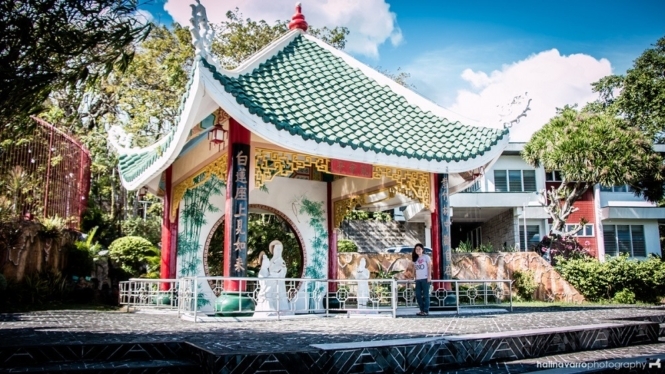 I enjoyed our visit in the sacred Cebu City’s Taoist Temple, located uphill in a subdivision in Cebu, and looking around the 340-year-old historical heritage site that is the Yap-San Diego Ancestral House. Later that afternoon, we dropped by a pasalubong center for Cebu’s dried mangoes and other local delicacies such as otap and butterscotch breads. This marked the end to our Cebu-Siargao voluntourism trip. I feel like we’ve only touched a bit of what Siargao has to offer and there’s still a lot of reason to go back in the province. Siargao has other islands that we haven’t seen, and a traveler we’ve come across mentioned newly discovered caves that are still not open to the public for spelunking. Hali would also like to go back to General Luna for surfing; travelers should spend at least a whole day in here to fully understand why Siargao is dubbed the Surfing Capital of the Philippines. All in all, a very worthwhile trip. This voluntourism venture in Siargao is originally a project of Kuya Danny, our group’s beloved caterer. I met Kuya Danny in our outreach in Jomalig. He prepared lunch for the whole team. I was amazed then with the way he handled the food; after 3 hours of land travel and 6 hours in the sea, the rice was still warm. The meals were complete –- from vegetables, to the main course, to dessert (his famous peach-mango creme). We were spoiled with his cooking. After Jomalig, I saw him again in another outreach event in FAMY, Laguna, and the last time, in our pre-outreach meeting for Siargao in Megamall. He still looked well, though there was already a hint of sickness. Siargao was Kuya Danny’s hometown. His family lived a humble life in the seas of Siargao, his father a fisherman. He told us that, as a kid, his playground was its untouched lakes and pools, way before commercialization encroached the province. 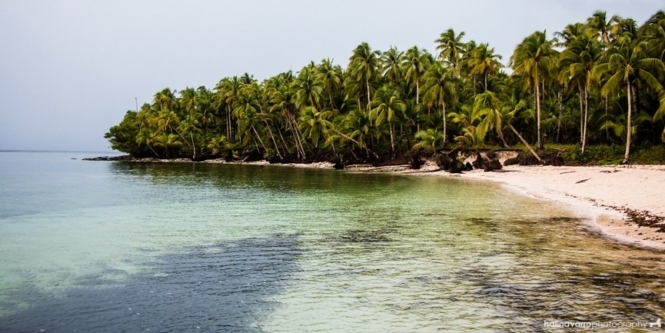 In time, the islands were brought by foreign owners, and commodity prices skyrocketed. The residents were not able to catch up. Many places remained poor, and Kuya Danny eventually escaped to Manila. He wanted to give back to the place he grew up in, where despite lack of material things, his family nourished him with love. We planned this outreach event as early as June. Kuya Danny offered to take the donations via ship to Siargao, since flight baggage is too expensive. He planned the accommodation, land and boat transfers. However, a week before the actual event, Kuya Danny messaged us to say he would not be able to come with us due to his condition. We debated whether to push through; the logistics was against us. Kuya Danny requested that we do. Even in a hospital bed, he found us a proxy from Team Hamog, Kuya Ralph, who would take the boxes of donations to Siargao, and made sure we had proper accommodation through the help of his relatives once we get to Siargao. During our stay there, Kuya Danny even called to make sure we were welcomed and well fed. His relatives also prepared salad for us, his instructions I assume. 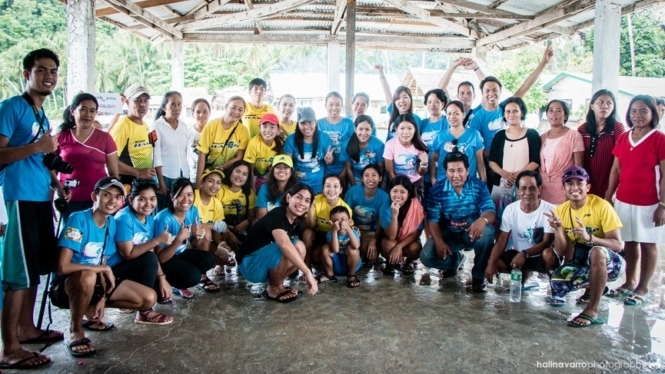 Our outreach event for children in Barangay Caob in Siargao was successful. Two days after we were back from Manila, Kuya Danny passed away. I think Kuya Danny merely waited for the culmination of the outreach event, his achievement, a final request. I hope his soul rests in peace, knowing that even in the face of illness he still found a way to push this project through. Kuya Danny was an active volunteer and organizer of outreach events. He had a successful catering business. He was thoughtful and humorous, with a strong sense of justice. This is for you Kuya Danny. I hope we made you proud. Do you join voluntourism events as well? Let us know your story in the comments below! Though I want to keep everybody updated myself, the list of people who’re requesting that I message them for upcoming outreach events is getting long and I’m afraid I can’t keep up. 🙂 Thank you so much for your interest. Very meaningful travel. I adore people who help kids and values their need of good education. Bammmm. That’s a very nice view of the beach. White sand. I’m sorry to hear about your Kuya Danny. It looks like he just made sure that you guys are well settled and the plans to visit Cebu-Siargao will be successful before he leaves. I’ve been to Cebu but I have never visited Siargao yet. The place looks lovely! I agree to go for a swim while whale watching. I’ve tried it and it was very awesome! I adore how you could do it in five days. One week was never enough for me in bantayan island, Cebu. Lol But what amazed me most is the purpose of this travel. Keep traveling with a cause! Wow, you’ve done so much in your trip. I’ve never been to Siargao though I am planning to go there of course. I’ve been to Cebu but back then I didn’t know anything about Oslob so I missed it. I will use your itinerary as a guide for my trip there. I’m sorry about the passing of Kuya Danny, he seems like a wonderful person. I never thought that Cebu and Siargao is magestic. As I browse through your blog posts I am starting to pursue traveling. All the photos you took are eye candy but the one you captured at Magpupungko Pool is amazing. I also admire you that you can do outreach events while traveling. Hey NICE! I have been to Cebu several times pero I have never visited Siargao… Sorry about Kuya Danny pero he is the epitome of people in the provinces who extend themselves for others. I’ve always wanted to go to Siargao because of Magpupungko. And those are parts of Cebu I haven’t explored yet. I definitely agree about voluntourism. Nice of you guys to contribute and do an outreach there. I’m sure you have made him proud. My condolences. The paradise that you’re describing makes me feel to travel so much! I’m sorry to hear about your caterer. My condolences. I’m sure he is proud of how you shared your experiences in Siargao, the volunteering, and everything. I’m glad that you’ve found someone to travel with. Been traveling solo in and out PH, and was hoping to find a more permanent travel buddy as well. 😛 Cheers to more travels for both of you! Oh, Kuya Danny was not our caterer per se, in that we didn’t pay him for helping with food preparation and all. We just fondly call him that because he had a catering businesses and he used to led feeding programs for the children (and us).